Clean green energy! This gluten-free pasta is packed with raw green power. Eat it and you’ll be springing around like a leprechaun. 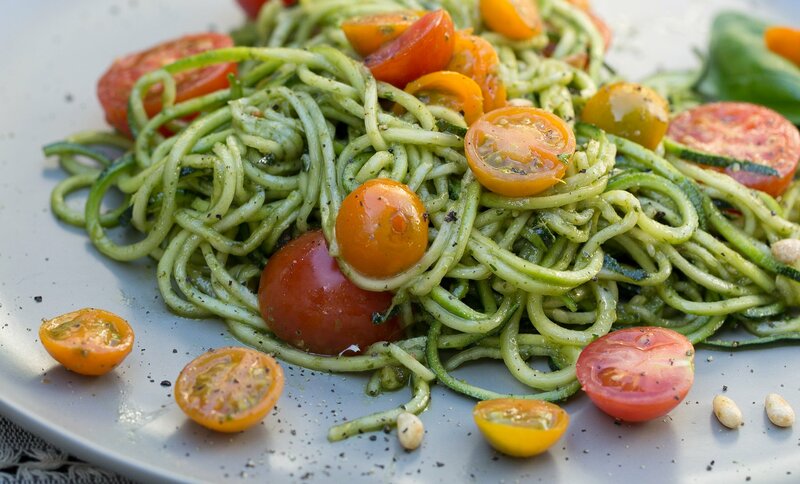 Use a spiralizer to make zucchini linguine. Sprinkle lightly with salt, and place in a colander over the sink to drain for about 20 minutes. Rinse, and then set aside. Make this lemony pesto in the blender, using the basil, garlic, lemon juice and olive oil. Taste and season with salt. Mix the pesto with the pasta (hands are best). Serve adorned with cherry tomatoes and pine nuts.